Today is World Diabetes Day! Did you know that diabetes is actually quite a common condition in dogs and cats? Read on to learn how to help prevent your pet from developing diabetes, what symptoms to watch for, how we treat diabetes in pets…and meet Suki, one of our diabetic patients! Diabetes is a disease of the pancreas (the organ that produces insulin), and in the simplest terms, means that the body has lost its ability to control blood sugar levels and properly produce energy. 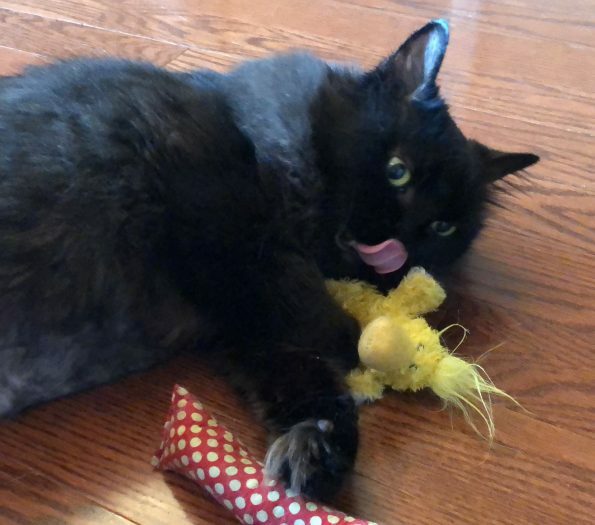 Risk factors can vary between cats and dogs, but include obesity, lack of activity, breed, chronic pancreatic inflammation (pancreatitis) and concurrent diseases like Cushing’s. Certain medications like steroids can also increase the risk of diabetes, especially in cats. Signs that a pet may have diabetes include unexpected weight loss, increased drinking and urination and often an increased appetite. They can also have a condition called diabetic neuropathy that causes weakness and an abnormal walking pattern known as dropped hocks. Testing for diabetes often involves assessment of blood sugar, urine, and sometimes a test called a fructosamine that gives an average blood sugar over a few weeks. Treatment for both dogs and cats typically requires twice daily insulin therapy. Diet can also help to manage diabetes. Cats will benefit from a low carbohydrate, high protein canned diet to help regulate diabetes. For dogs there are less specific recommendations but usually a low fat/higher fibre weight loss diet is ideal. The best way to monitor response to treatment is with serial glucose measurements using a glucometer, which we teach owners to do at home to minimize their pet’s stress. With cats, we can occasionally see diabetic remission, where eventually insulin therapy is no longer needed. This is most likely to occur when diabetes is diagnosed early and treated proactively with insulin and diet changes. These pets can often discontinue insulin once they are in remission, and be managed with diet and occasional blood sugar monitoring for future relapses. Complications associated with diabetes in pets can include diabetic ketoacidosis (when chronic diabetes is left untreated/unregulated) and hypoglycemia (when diabetes is over-controlled). Diabetic ketoacidosis eventually occurs when the pet’s body starts trying to ferment the glucose from food that has built up in the blood, since the pet doesn’t have enough insulin to take that glucose into the cells and tissues where the body normally produces energy. Hypoglycemia (low blood sugar) can occur when pets receive more insulin than they need and so too much glucose is taken out of the blood and into the cells, either because they are not eating, they receive an accidental overdose, or they continue to receive insulin after they have gone into remission and no longer need it. This is an emergency that requires immediate care and treatment to return the pet’s blood sugar to safe levels. Symptoms can include lethargy, weakness and seizures, and if those occur in a diabetic pet it’s essential to contact a vet immediately! Diabetic pets can also be more prone to developing urinary tract infections, so it is important to monitor their urination habits closely, and notify their vet if you notice any changes. Once their blood sugar is under control, most diabetic pets can live happy healthy lives, and many eventually don’t even mind their injections too much! And if your pet doesn’t have diabetes, you can help prevent it by keeping them active and at a healthy weight. If your pet does develop diabetes, your greatest chance of catching it early (when it is most treatable) is by making sure they see a vet for comprehensive exams at least annually, including regular wellness testing of their blood and urine, which will identify early changes that are markers of diabetes. Our feature patient is 13 year old Suki from Annex Cat Rescue. Suki was diagnosed with diabetes about a year ago, and switched to a diabetic diet and started getting insulin twice a day. After about 6 months, she went into remission, and was managed just on her diabetic diet for several months. Like many diabetics, it is a lifelong condition though, and when she came in for an unrelated cardiac emergency last month, we discovered that she was also diabetic again. Suki is now balancing diabetes and heart failure, and is on three heart medications in addition to her twice daily blood sugar testing and insulin. Her medical needs seemed overwhelming to her new foster mom at first (which is very common for owners of newly diagnosed diabetic pets), but it just took a week or two for Suki and her foster mom to get into a good routine, and now her care only takes 5 minutes in the morning and 5 minutes in the evening. She is also feeling better than she has in a long time, as you can see in her picture! If you have any further questions about pet diabetes, please contact us!